It is indeed one of those bits of glassware that everyone recognises. Hold one of them up while wearing a lab coat and you are The Scientist (do the same wearing blue jeans and a T-shirt and you’ll be arrested as a crystal meth maker). It appears on countless logos and advertisements. To those educated, as I was, in North America, it’s an Erlenmeyer. To the French it’s simply an ’Erlen’. The Italians use the curious word ’beuta’. For such basic kit, it is surprising that, until 1900, pictures of the flask in textbooks are few and far between. 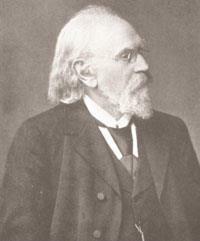 Richard August Carl Emil Erlenmeyer was born in Wiesbaden in 1825, the son of an evangelical pastor. Like many a teenager, Erlenmeyer wanted to study medicine. Starting his studies in Giessen, he was so astonished by Liebig’s lectures in chemistry that he soon switched subjects. Unfortunately, competition for places in Liebig’s famous lab was fierce, and he wandered between research groups until his money ran out and his father insisted he get a ’useful’ qualification in pharmacy. This later came back to haunt him, when the notoriously irascible Hermann Kolbe dismissed his views with the words ’Once a pharmacist, always a pharmacist’. Eventually, he wound up in Bunsen’s lab in Heidelberg working on fertilisers. But as Bunsen would not permit his associates to do any teaching, Erlenmyer hit on a scheme to get round this. Using some of his wife’s money for the down payment, he took out a mortgage on a big shed, which he converted into a lab, and began taking students. In this period he also travelled, meeting in London, amongst others, the ambitious young August Kekul? who shortly thereafter also moved to Heidelberg. They began lecturing together. When Kekul? moved to Ghent, Erlenmeyer succeeded him as the editor of his Zeitschrift der Chemie . This plunged him into hotly-contested theoretical debates about chemistry, in which he sided against Kolbe and Berzelius, and with Kekul?, Williamson and Russian chemist Butlerov, who argued that connectivity lay at the heart of organic chemistry. Butlerov was the first to state that every organic compound must have a distinct structure, while Erlenmeyer first enunciated the idea that carbon atoms could be linked by single, double or triple bonds. His connections with Butlerov also ensured that a steady stream of students, from Borodin (the composer who discovered the aldol condensation) to Markownikoff, came through his lab. Among many contributions, Erlenmeyer elucidated the fused aromatic structure of naphthalene and showed that a -unsaturated alcohols rearranged to aldehydes. He also started a number of more or less successful business ventures including dyestuff and fertiliser plants. 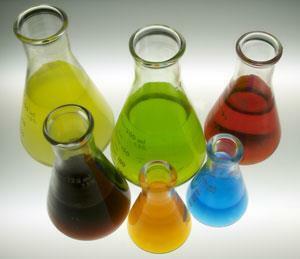 In spite of his many activities, Erlenmeyer remained, at heart, a practical chemist. He devoted a lot of time to his students, smoked fat cigars in the lab, and, reported Volhard, whistled Wagner tunes as he worked. He invented the asbestos gauze, crucial, in the days before Pyrex, to protect glassware from the thermal shock of a roaring Bunsen flame. He devised his eponymous flask in 1861. With its wide flat bottom, it was perfect for heating solutions, greatly aiding operations like recrystallisation. Equally, the sloping sides made solutions unsloppable, ideal therefore for swirling the analyte in a titration. The flat bottom also had the advantage of giving a solution a uniform colour across the entire flask, making it easier to determine end points. With a ground glass joint at the top, internal projections, or a side-arm or two, the conical flask would find an infinity of uses. We all have them. We all love them. And why do Italians call their favourite flask a ’beuta’? Possibly from the word for a drink, bevuta. But why would anyone want to quaff from a conical? Any ideas?